Listen, Grant Morrison deserves all the praise he gets. He’s one of the greatest scribes to ever grace a comic book page, a maestro if you will. However, while Grant will most likely dominate the headlines, I’m to tell you that Liam Sharp and colorist Steve Oliff are the ones that need to have their praises sung. First up is Sharp’s absolutely gorgeous pencils, a combination of textured detail with amazing storytelling and mind blowing layouts. Despite the extravagant opening sequence, Sharp’s pencils make this insane universe feel believable. Everything has a breathe in approach, the touch of realism that doesn’t take away from the surrealism. Personally I love how he depicts Hal’s posture, a mix of confident and easygoing which is how I would personally sum up Hal. Sharp’s pencils are far from traditional, it’s unique style that meshes perfectly with Grant’s script. As for Steve Oliff, his colors remind me of a classic silver age comic, but for a new age of readers. Vibrant but with definition,it’s Green Lantern after all. His colors mesh well with Sharp’s pencils, a cohesive team bringing life to this insane script. If there’s one thing that I know about Grant Morrison’s writing within the DCU, he loves the silver age. Just look at All Star Superman and with The Green Lantern this is no exception. Right out of the gate, Grant makes the focus be entirely on bizarre Green Lanterns, only to shift said focus to Hal seemingly bumming it on planet Earth for whatever reason. Mixing the mundane with the fantastic, a mixture that on paper shouldn’t work but that’s because most writers tend to try and explain the reasoning for everything. Grant just drops the reader right into a situation that is familiar, respecting their intelligence. My only real criticism with this debut series, is that Hal’s voice feels a bit hollow. Since Morrison wants to evoke the silver age, then he wants Hal to become the lovable cardboard once again. I understand that Morrison wants to make this series more about the space cop aspect, but Hal is severely lacking his high octane attitude.Perhaps it’s a plot reason Hal doesn’t exactly feel like himself, but as of this point it’s to early to tell and I already miss Hal’s bravado. The biggest question that most readers will have, is how accessible will this new series be. Despite this being a new series, Morrison isn’t known for making things simple for the sake of new fans. In comparison to Morrison’s other works, this is a great jumping on point for new or lapsed readers. It doesn’t shift the paradigm to much for Hal (except for the new blonde in his life? 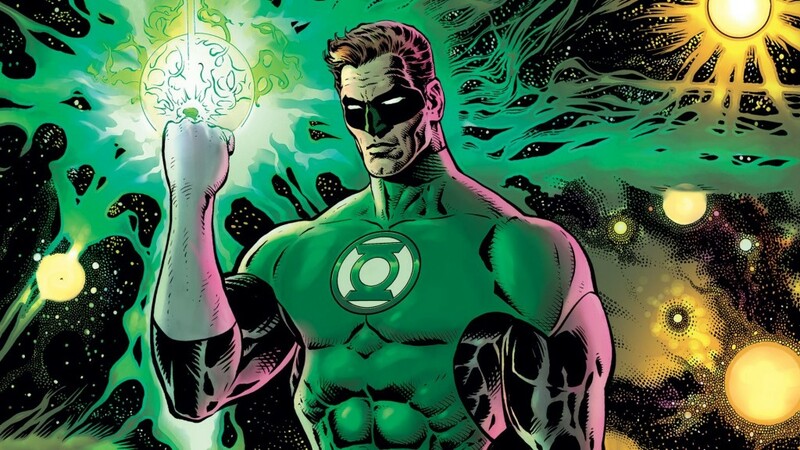 ), but instead gets rid of all the excess and boils down to what a Green Lantern is at the core. A space cop dealing with criminals on a galactic scale, there’s enough silly silver age homages to make this feel different than what DC is currently publishing. You combine that with Sharp and Oliff on art duties, this is a book that will bring readers back to world of Green Lantern. An amazing debut issue, if you’ve never read Green Lantern before, now’s a perfect time to start.